Time and again in the exam room we are asked if a particular teeth cleaning chew is appropriate for dogs. Clients describe anything from bones, to particular products marketed exclusively for teeth to other chew toys commonly found in pet stores. There are too many products out there to be familiar with all, but we can offer some helpful hints in order to choose safe options for your pets. Careful selection of appropriate chews is very important to your pet’s oral health, not just for the purpose of cleaning their teeth, but to not cause damage to your pet’s teeth as well. When dog’s chew a chew toy, they do so with great strength using the large 4th premolar, also known as the Carnassial tooth. It is the largest tooth in their mouths and is the main tooth used for chewing and grinding up food. 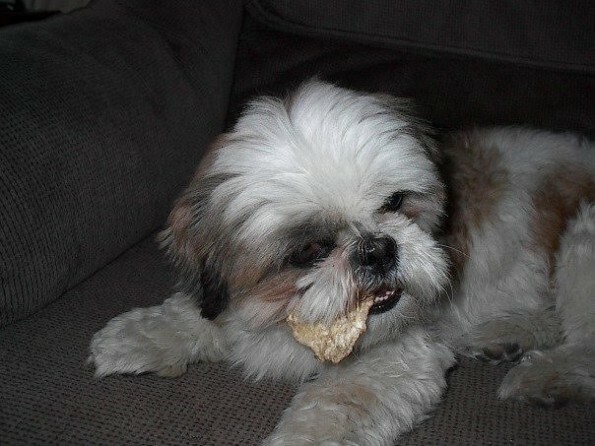 Dogs that chew hard chews may fracture the exterior part of the tooth. This is called a slab fracture. 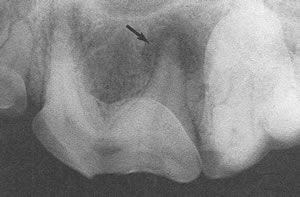 This type of fracture exposes the sensitive “pulp chamber” inside the tooth which contains the blood vessel and nerve. It is a painful lesion and places the tooth at high risk for abscess/infection. X rays of the tooth are required to determine if the pulp chamber is exposed, giving bacteria access to the root and other sensitive structures of the tooth and to ensure that surrounding teeth have not been damaged as well. Treatment options include a root canal if the tooth meets criteria or surgical extraction of the tooth. This tooth contains 3 roots which extend deeply into the jaw bone. It is a painful lesion and requires extraction. Dental fractures caused by hard chews are one of the most common reasons for extractions in dogs. Obviously we want to try to avoid these injuries and extractions at all costs. Although most people feel hard chews will help clean their pets teeth, they will likely fracture them as well. The Veterinary Oral Health Care Specialists (VOHC) is a group of board certified veterinary dental specialists. They have a “kneecap” rule. If you wouldn’t want to be hit in the kneecap by a chew you are contemplating giving your dog, then it is too hard and should not be given to them, as it can fracture their teeth. Bones, antlers and other synthetic hard chews are good examples of this. CET chews are a good example of a safe chew. You can look for the VOHC seal on any dental product to see if they have approved it as a safe and effective part of your pets health care routine. If you have any questions regarding safe chew toys or fractured teeth please call or make an appointment to speak to one of our veterinarians or veterinary technicians. Happy chewing!